Why are sandwiches so popular? There are a lot of reasons. Perhaps the biggest one is the sheer number of ingredients that can be placed between two slices of bread or on a bun and be eaten anytime. Personally, I like a sandwich that has a little bit of kick to it. That’s why those that are spiced up with a rub or sauce have special appeal, such as the following recipe, which I prepared recently with a 2-pound bison roast. The roast was left over from the previous day. I had sliced a little more than 1½ pounds off a 3¾-pound roast for use in making Swiss steak. While there’s no doubt we would have eaten all of the meat if we’d done a traditional pot roast with potatoes, carrots and onion — much of it as leftovers on some nice bread with a slathering of mustard or Miracle Whip — this turned out to be a great way to produce the centerpiece for two meals. And one of them that just happened to center on a tasty sandwich! Sprinkle roast with salt and pepper. In a nonstick skillet, brown roast in oil on all sides over medium-high heat; drain. Transfer roast to a slow cooker. Combine the ketchup, water, onion, brown sugar, Worcestershire sauce, lemon juice, vinegar, mustard, celery seed and chili powder; pour over roast. Cover and cook on low for 8 to 10 hours or until meat is tender. 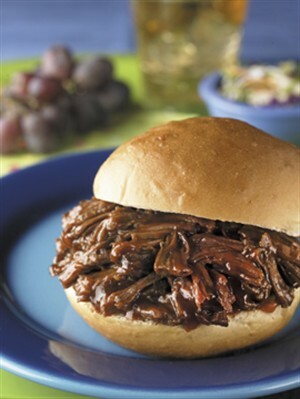 Remove meat; shred with two forks and return to slow cooker. Spoon ½ cup meat mixture onto each bun.